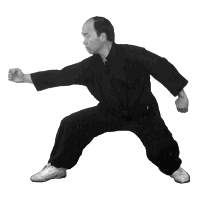 Chen style Tai Chi Quan is the oldest and the most martial of the four major styles. A very effective style, it is taught as a fighting art, unlike its younger cousin Yang Style Tai Chi Quan, which stresses the health aspects of the art. In the Wu Tan Kung Fu Institute, there are three levels of training. The first level is the 36 Movement form. It is done slowly with some fast and explosive movements. The second level is the Lao Jia or the Old Frame. It is quite similar to the 36, but there are over 72 movements. The final level is the Pao Chui form or cannon fist. Pao Chui teaches how to issue jing (internal energy) and contains very fast movements. Suspend the head from above and keep it straight. Depress the chest and raise the upper back. Understand and practice the difference between solidness and emptiness. Lower the shoulders and elbows. Practice the use of will and not force. Connect the upper and lower portions of your body. Unify both internal and external movements. Practice continuous movements and coordinated movement. Practice and demonstrate serenity during movement. There is a popular folk story that credits a Daoist monk, Zhang San Feng, a master of Shaolin Chuan (Shaolin Fist style), for the creation of Tai Chi Quan. The story claims that one day, Zhang San Feng observed a fight between a crane and a snake. Zhang was impressed with how the snake did not fight against the crane's blows; it avoided the crane's hit. After realizing that force is not needed in combat, Zhang combined the Daoist teaching of opposites (the Yin and Yang theory), the fighting techniques of the crane and snake he observed, and the techniques he learned from Shaolin into what is now known as Taijiquan, the grand ultimate fist style. This story is disputed by many Tai Chi practitioners. Historians believe that Tai Chi Quan was created in the Chen Village, Honan Province, which is near the Shaolin Temple. Chen Wang Ting, an ex-military officer and an expert in Shaolin Chuan, was the actual founder of the art. There is proof that Chen Wang Ting actually lived and practiced Tai Chi, whereas it was never recorded in Chinese history that Zhang practiced or created Tai Chi Quan. Master Kurt Wong of the Wu Tan Kung Fu and Tai Chi Institute learned the Chen Style Tai Chi Quan from Master Adam Hsu of Taiwan. Master Hsu was encouraged by Grandmaster Liu to learn the Chen style from Sifu Tu Yi Che. Sifu Tu was a student of Chen Yen Hsin of the Chen Village . The style from this lineage is the Lao Jia, the original style. 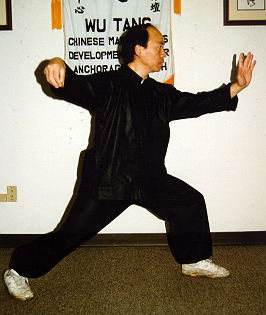 Chen Fa Ke's lineage (Chen Yen Hsin's son) teaches a different set called the Xin Jia, new frame, along with the Lao Jia. 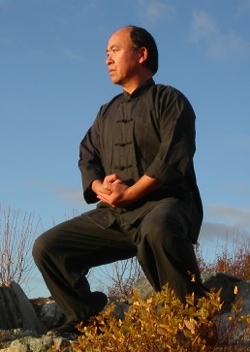 Master Adam Hsu also teaches a rare version of the Chen style, Thunder Chen Style Tai Chi Quan.